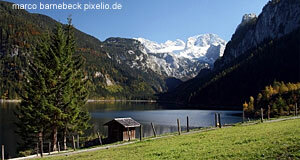 The market town of Bad Goisern with its slightly under 8,000 residents is a real hub by southern-Salzkammergut means. Compared to other towns and villages in the surroundings, Bad Goisern attracts few international visitors. The tourists that come are mostly domestic ones or Germans that appreciate it as a stepping stone into the hills and mountains of the Salzkammergut. Like most of the Salzkammergut, Goisern was settled early on - probably in Neolithic days. However, the first written record of the settlement dates back only to the 14th century: A document from 1325 describes the village of "Gebisharn". The centuries that followed were rather uneventful, as Goisern was not a major place until well into the 19th century. Only with the rise of "Sommerfrische" tourism - aristocrats from Vienna would spend a few weeks hiking and relaxing in the picturesque villages of the Salzkammergut - the town gained significance. In 1931, it was assigned the status of a spa town, indicated by the "Bad" ("bath") in front of the actual name. Today, most visitors come rather for the mountains than for the cures, though. There are manifold hiking routes in and around Bad Goisern. In terms of sightseeing, there is less to do. You can see an open-air museum that consists of a farm / mill building, which has an array that is typical for the Salzkammergut. This "Anzenaumühle" consists of a twin court that serves as a residential main building, a barn, a mill and a saw house. Otherwise, I recommend looking for shoemakers: The "Goiserer" is a famous, hand-crafted hiking boot of extremely high quality and even higher price. It is only made on demand and crafted at custom for each individual customer. If you want to buy a Goiserer for yourself, let a shoemaker take the measures and expect a waiting period of several months. However, once you finally get this piece of leathery craftsmanship, you will be among an elitist club: Celebrities like Arnold Schwarzenegger or Germany′s former chancellor Helmut Kohl love their Goiserer hiking boots - and within Austria, they are a legend like Savile Row suits. Speaking of rustic things: Austria′s most famous right-wing populist Jörg Haider grew up in Bad Goisern. Today he prefers to present himself in traditional clothing from Carinthia, though. Another local hero is Hubert von Goisern, a musician who mixes traditional music from the Salzkammergut with folk music styles from other countries and contemporary music. He is mostly known within Austria. Attractions nearby Bad Goisern include Gosau with the Gosau Seen Lakes, Bad Ischl, Hallstatt with the Dachstein caves, Bad Aussee and Altaussee. Keep in mind that even small distances can be tricky to get by in the mountainous Salzkammergut - travelling by your own mean of transport can help, but might turn out to be challenging and more time-consuming than you thought.